Okay, get ready. I have lots to say about this watch and I will state right off the bat: this watch rocks! 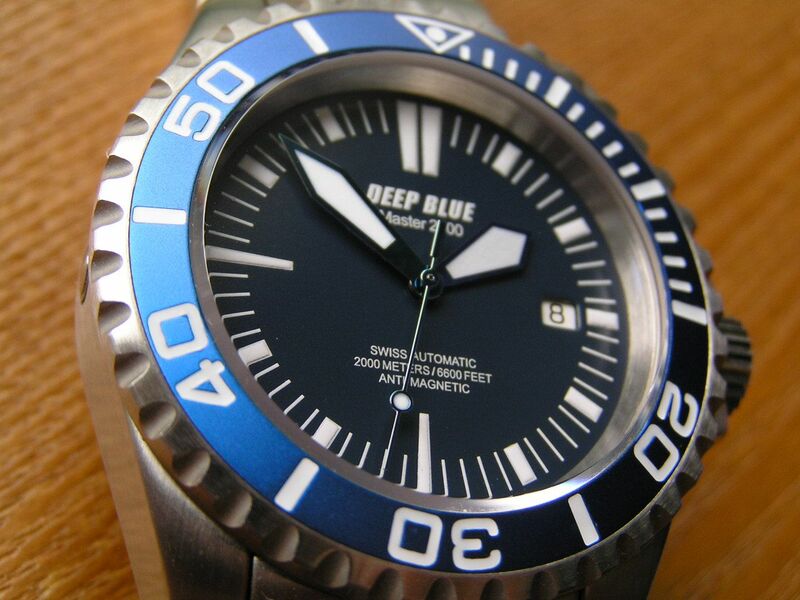 Admittedly, I don’t know too much about the Deep Blue brand, except that it is one of a myriad of ‘boutique’ diver watch brands currently on the market. 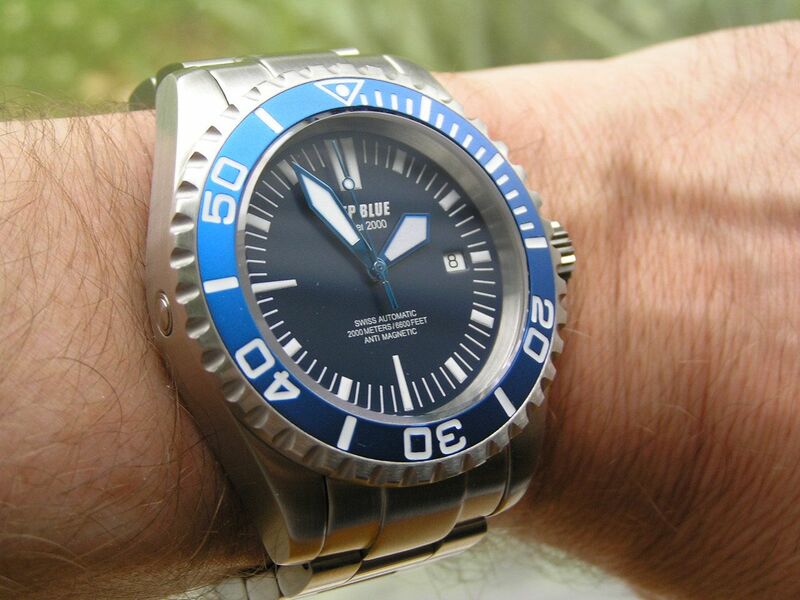 Many of these brands have their legions of fans (and a few detractors) and prices for these boutique divers are at times, overpriced in relation to the value delivered by the piece, in my opinion. 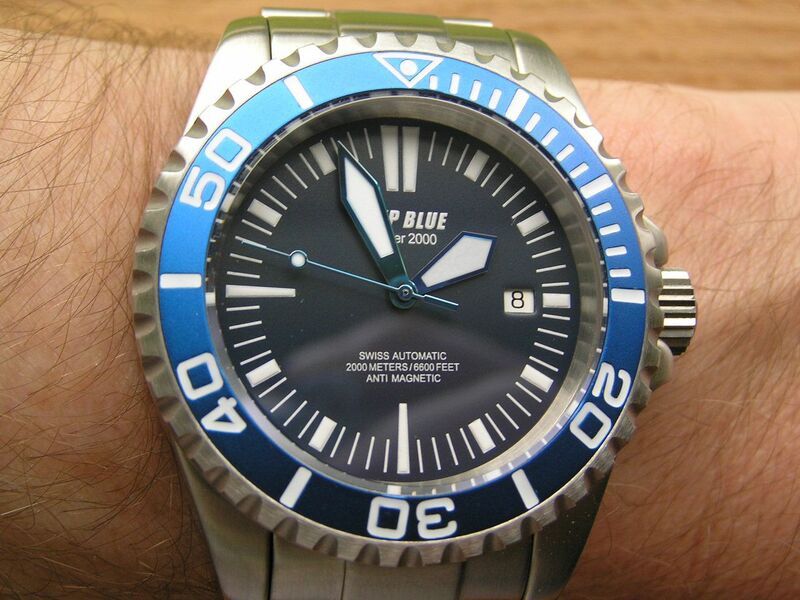 What I’m saying is I find it hard to justify a $750 dollar purchase on a boutique brand when for a bit more, you could get a name-brand diver that is probably better in most respects. But I digress and my editorializing on the subject is done. 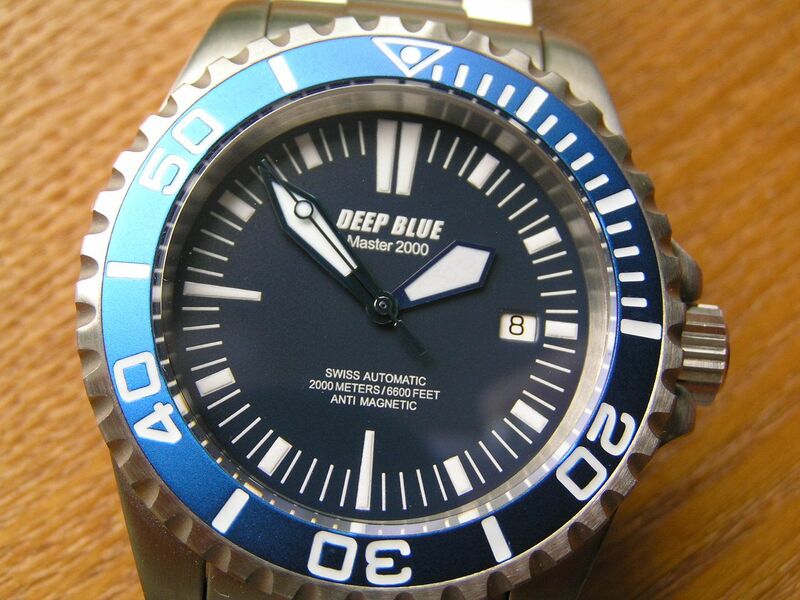 The Deep Blue Master 2000 is a superb watch in almost all respects and please remember, I have no affiliation with any of the companies that make the watches I review. I just really, really like this Master 2000. 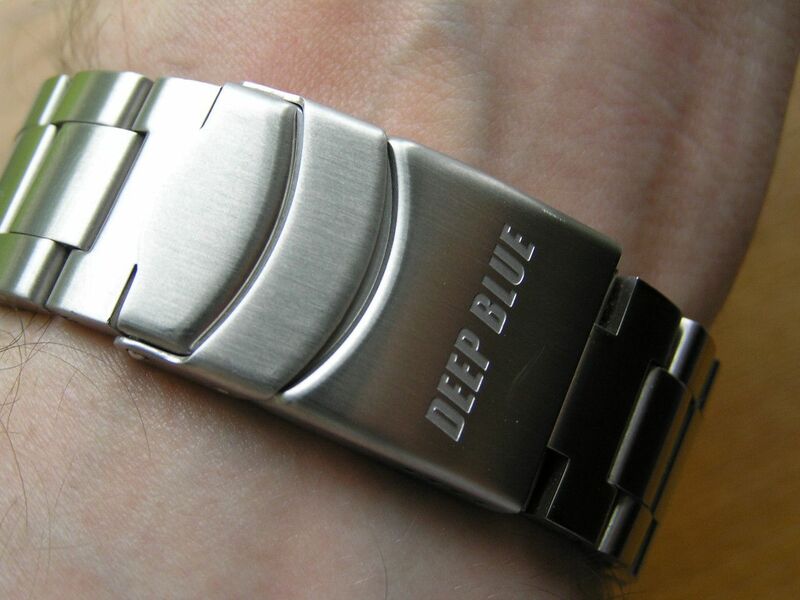 Deep Blue does state on their web site that their mission is to make high water resistance watches, and of course, the Master 2000 fits that bill. I first saw the Master 2000 at a local watch meet-up about a year ago and was smitten with its vivid blue bezel, overall fit and finish and hefty, but attractive looks. 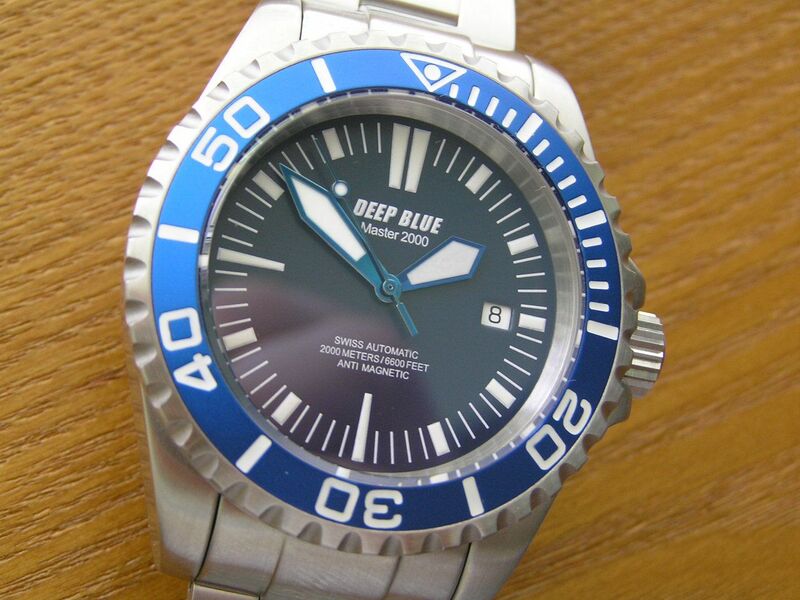 The Deep Blue brand has expanded considerably over the past year and now features quite a few models with quartz, automatic (both Swiss and Japanese) movements, tritium tubes, different styles, price points, etc. If you like what you read here, there’s probably a Deep Blue model that will suit you. 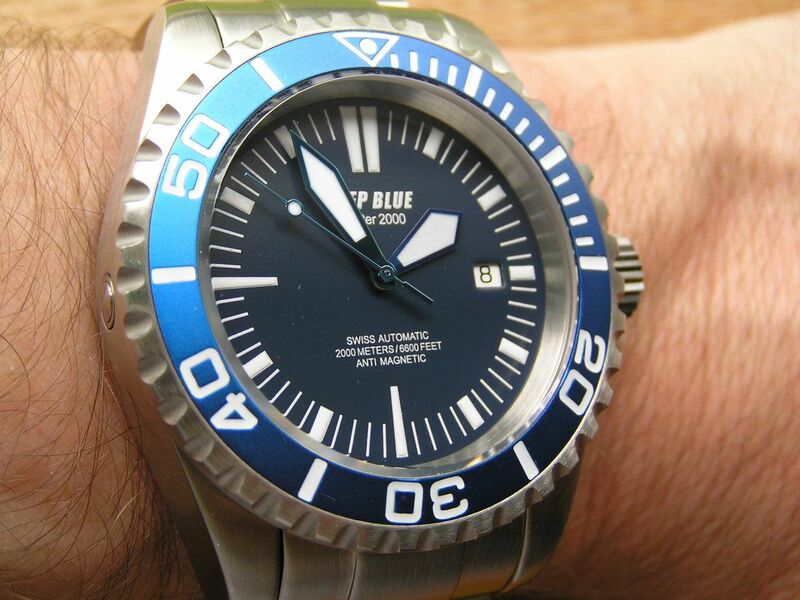 The Master 2000 is a large, big, chunky diver measuring 45mm without its large, signed screwdown crown with double o-ring gasketing; 49.7mm crown inclusive. The crown itself measures a substantial 7.3mm. Lugs are 22mm, thickness is appropriately, well, thick, at 17.5mm. A thick (there’s that word again!) flat sapphire crystal with anti-reflective coating covers the dial. 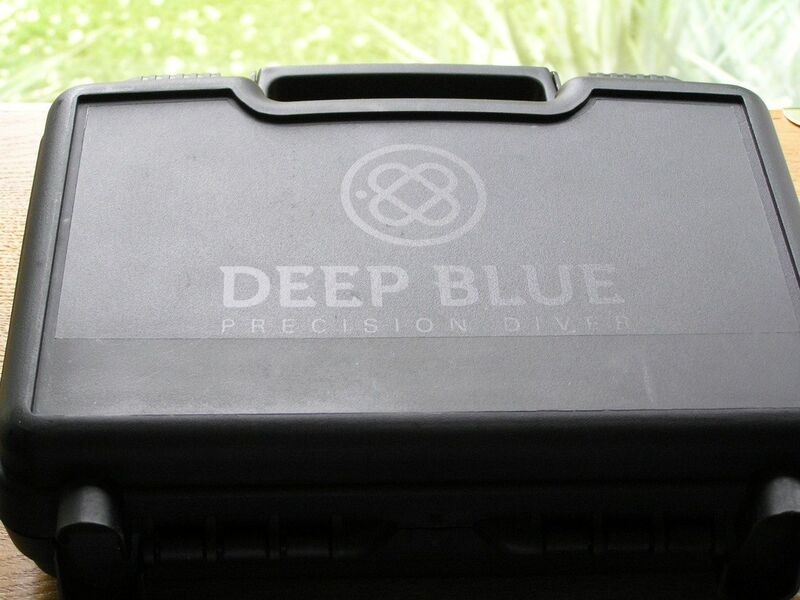 The screwdown case back features an embossed Deep Blue logo with diver graphic. 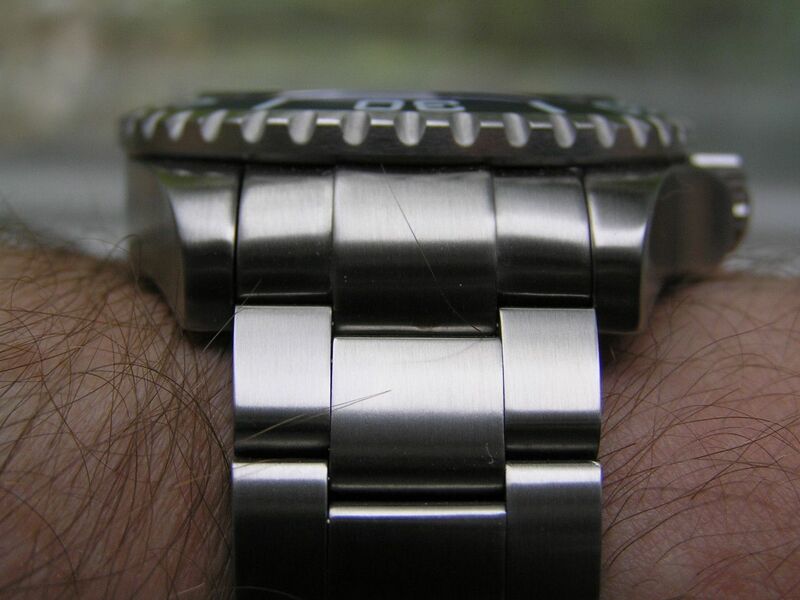 The entire watch is of course, solid stainless steel and fully brushed. An automatic helium escape valve (HEV) is centered on the left side of the case in the event you really do go deep sea diving with this piece, which is rated at an incredible 2000 meters of water resistance. 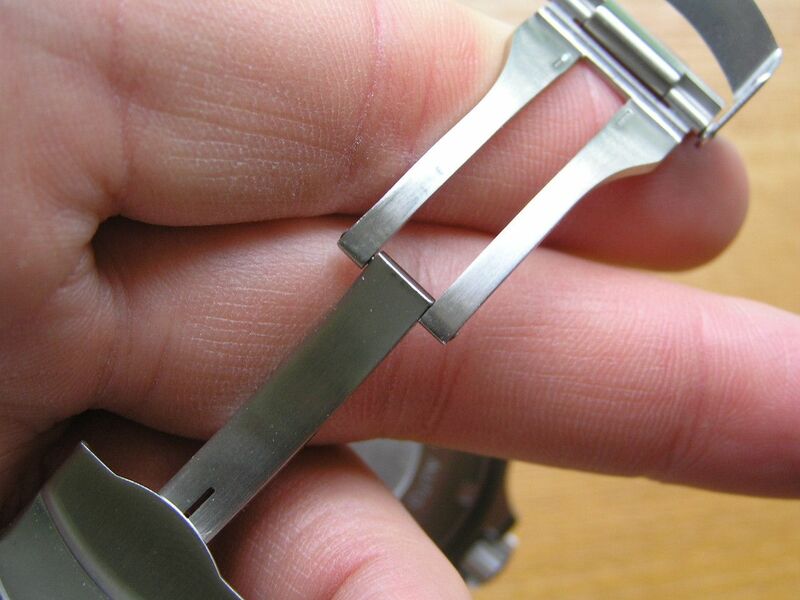 A high anti-magnetic rating of 70000 a/m is another feature of this watch. This Master 2000 features a dark blue dial that looks black in some light, but trust me, it is a deep shade of blue, which I did my best to bring out in the photos. 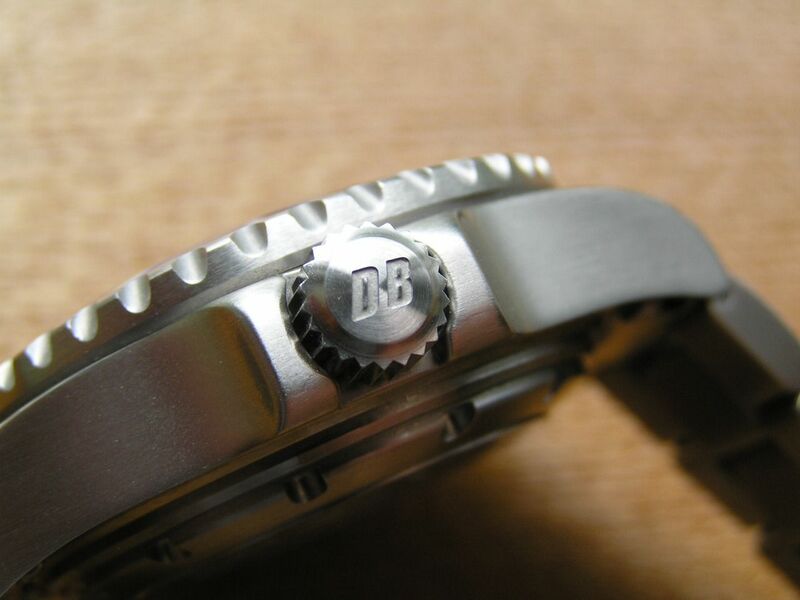 The plongeur style hands are blued with inset lume and the second hand is blued as well. The 120-click unidirectional bezel is an absolutely vivid and beautiful shade of blue that ties the entire watch together. 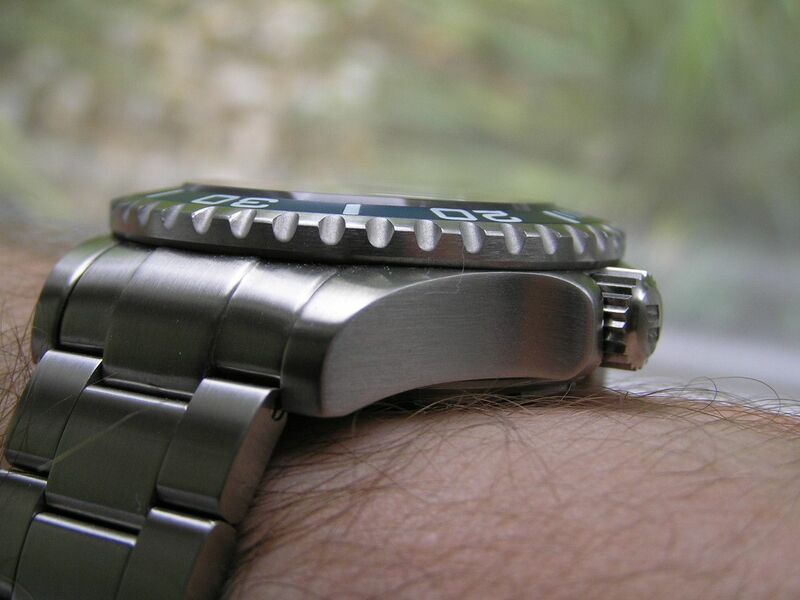 The bezel action is tight, with no backlash and has nice machined scallops that provide grip. 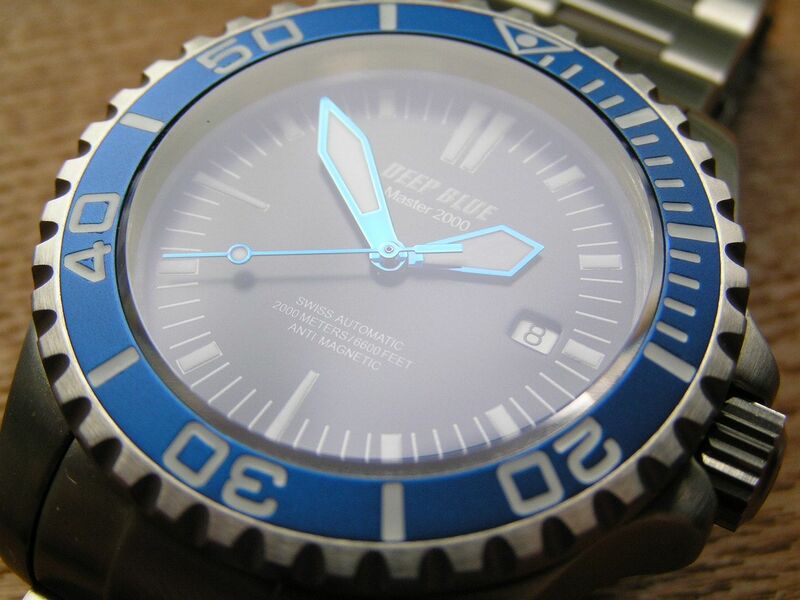 The dial features printed lume markers that comprise the chapter ring and all the markings on the bezel are fully lumed. Even the Deep Blue name on the dial is luminous. 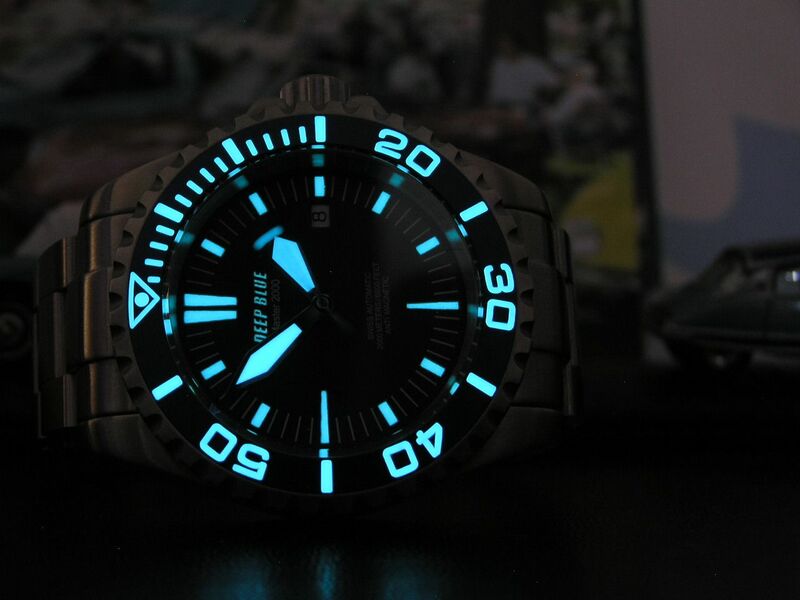 The Super Luminova BGW9 lume is white in color, but glows, what else, blue! 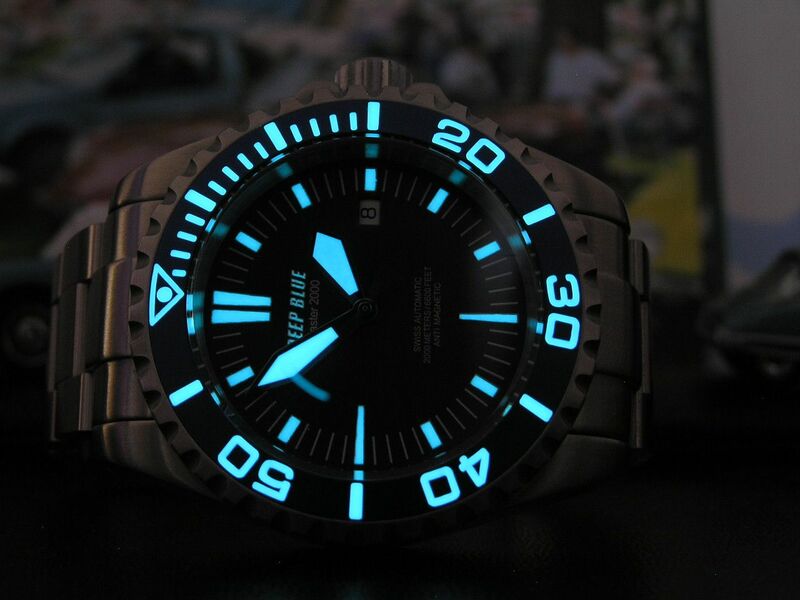 Superb, bright and long lasting lume. I think the lumed bezel looks awesome! A quickset date is located at 3. The alignment of the date inside the window could be a tad, and I mean a tad better, as it rides just a bit high, but not so much as to be distracting. Inside this Master 2000 beats the venerable ETA 2824-2 25-jewel Swiss automatic movement that can be hacked and manually wound. I don’t know if Deep Blue regulates the movements at the factory, but this 2824-2 is one of the most accurate I have owned, running about -2 seconds per day. Power reserve is the expected 42 hours. What impresses me about the Master 2000 versus the two other boutique divers I have owned (Bernhardt and Boschett) is that overall, the fit and finish on this piece is superior to those two other brands. The Master 2000 mentions that it is a Swiss Automatic on the dial, but isn’t trying to be something it’s not. It’s not pretending to be a Swiss made piece. 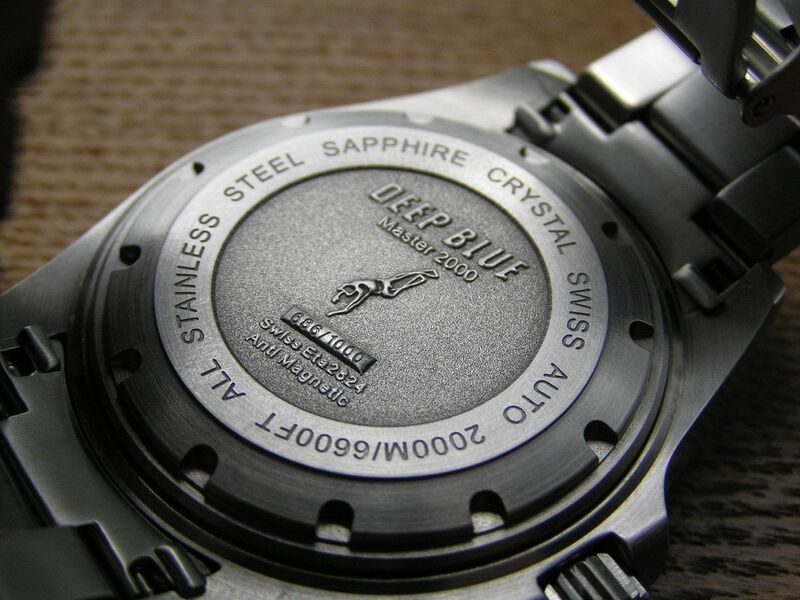 It represents itself as a total tool watch for serious divers and that is what it is, nothing more or nothing less. I like that approach. The Bernhardt I owned had a Swiss ETA automatic in it, as did the Boschett. The Bernhardt was good value for the price, but the dial looked cheapish and I hated the stock hands so much that I changed them out. The finish wasn’t all that great, either. The Boschett was on par price-wise with the Deep Blue and was Swiss Made, but the deployant was a cheap stamped piece (subsequently changed on later models to a proper machined deployant) but I never felt the Boschett exhibited the quality that its price should have demanded. I know others will disagree, but since I have owned all three, I put the Deep Blue at the top. 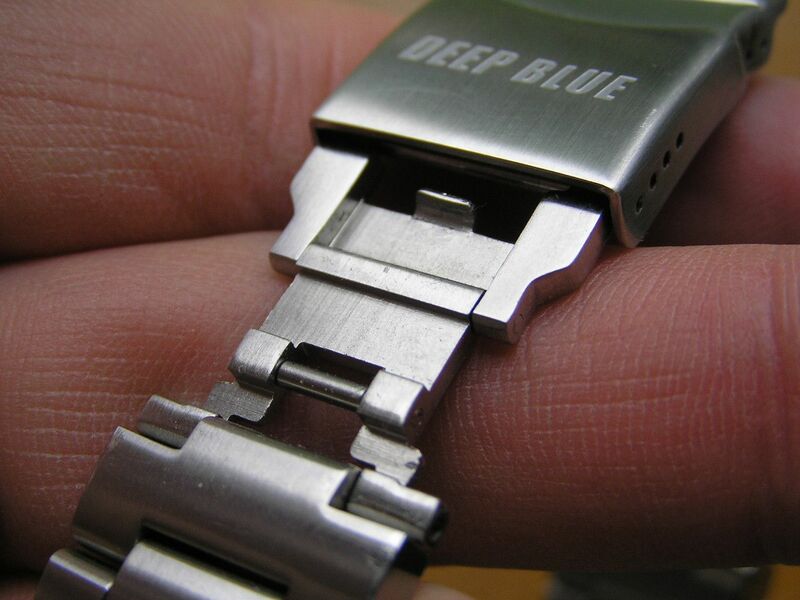 Overall build quality and fit on the Deep Blue is first rate. The 22mm stainless steel bracelet on the Master 2000 is an oyster style design with fully brushed links secured by screw pins. The bracelet has solid end links. The bracelet tapers to 19.7mm at the clasp. The clasp is signed and double locking, but lacks a pushbutton closure (demerits here, one of very few with this watch). The deployant is machined as well as the diver extension, which is a super nice detail. 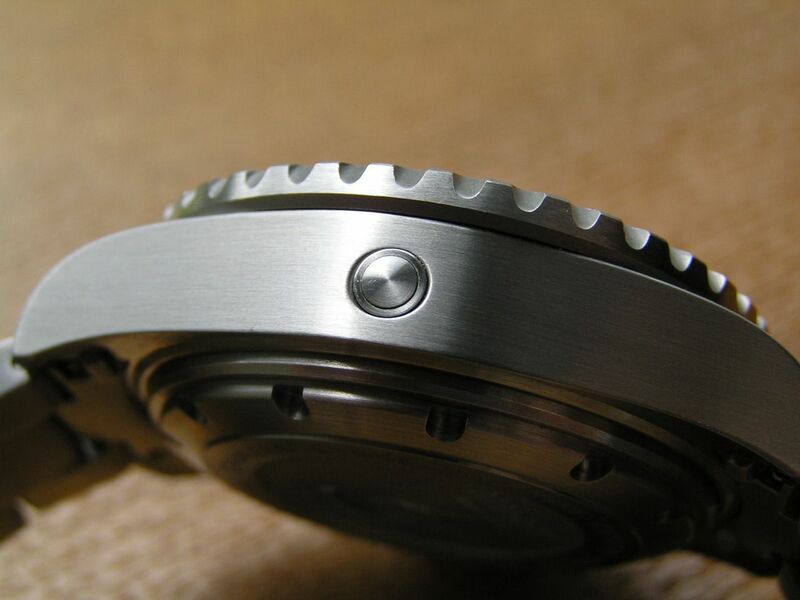 I have only one other watch with a machined diver extension (my Omega Seamaster). 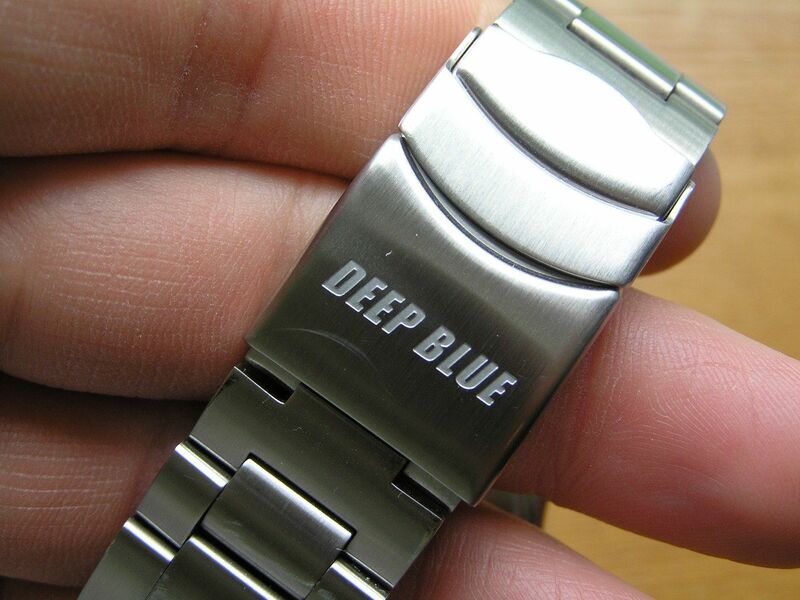 So kudos to Deep Blue for incorporating this feature on the Master 2000. Sizing was straightforward, with no stripped screws that can be irritatingly common with this type of securement. Half links are included with the bracelet to help achieve the best fit. 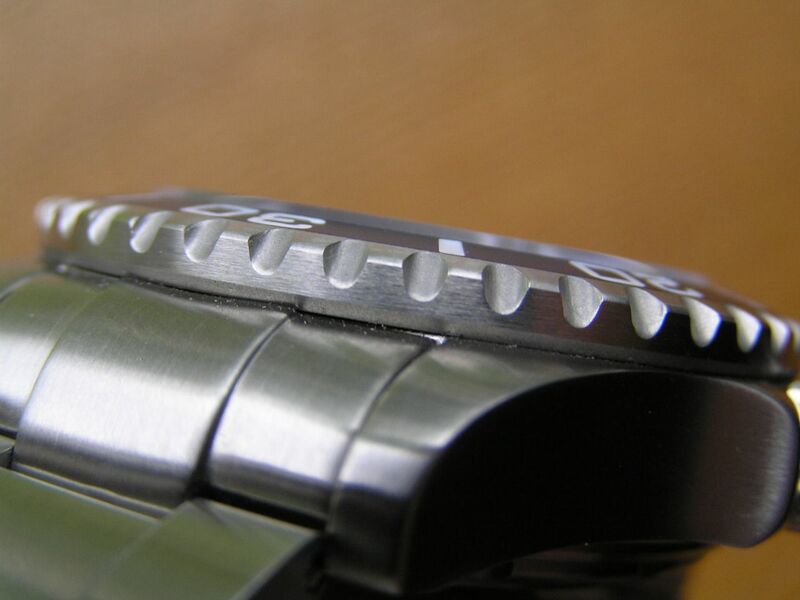 The clasp also has four microadjustment holes, which some companies seem to be skimping on as of late. Presentation is another strong point of the Master 2000. 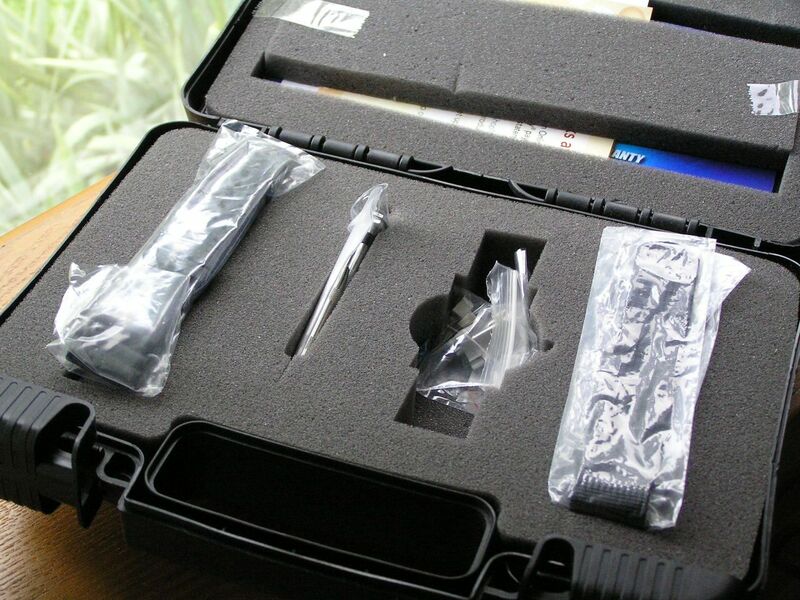 The watch arrives in a black plastic carry case with foam insert that houses the watch, a black nylon NATO strap and a black rubber dive strap along with strap changing and bracelet sizing tools. It’s a comprehensive presentation that adds a bit of extra value to this piece. The Master 2000 was a limited edition of 1000 and is sold out, so finding this piece may prove a bit of a challenge, but trust me, if you're lucky enough to get one, you should be satisfied. Big, yes. A bit unweildy, yes. Solid good looks, yes. Makes a statement on your wrist, definitely! Deep Blue has released Master 2000 II and Master 2000 III series watches, still with ETA Swiss automatics and some new dial colors. 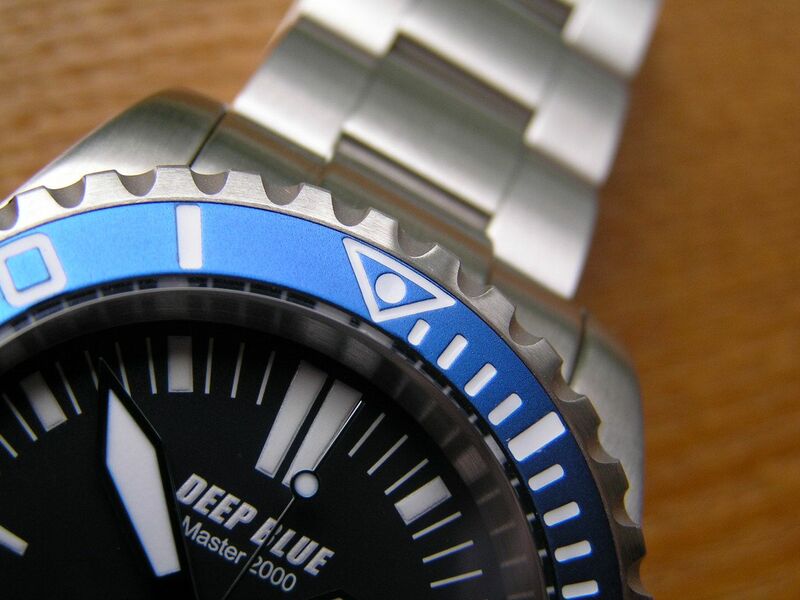 Verdict: a winner in almost every respect, this Deep Blue Master 2000 has shot to the top of my diver rotation. Strong value, great quality, stunning good looks, this one has it all! Oh and forgot to ask how does this compare to the Aramar Arctic Ocean? Thanks for reading. I do not live in the UK. I have no experience with the Aramar Arctic Ocean, I have never seen or handled one in person, sorry.